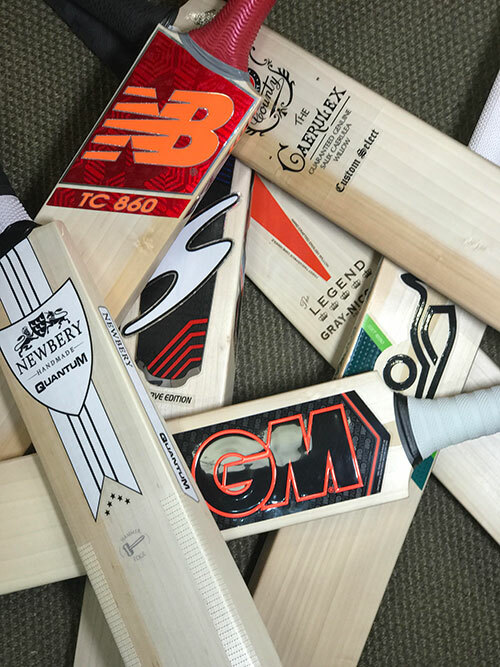 Cricket bats have come along way over the last few years, thanks to new manufacturing techniques as well as the cricket bat companies pushing new ideas through. The big guns like Gray Nicolls and Kookaburra have all introduced some innovative models like the Neon, Chrome and Kaha from Gunn & Moore, the Velocity from Gray Nicolls and the stylish Ghost range from Kookaburra. Bigger than anyone, is the SS Ton brand. SS Ton produce more bats than any of the big three just mentioned and are one of the most widely used bats amongst test and one day players all over the world. At VKS we like to stock quality cricket bats that serve our customers well. Cheap cricket bats just don’t fascinate us, good value for money bats certainly do. Whilst we have good quality English willow bats from under £100, we ensure they look as good as possible for the money and perform well too. Junior cricket bats are now more popular than ever thanks to the growing number of children playing the game. We have bats from Size 0, for less than £30 up to top of the range English willow models selling for £250. Our knowledge and expertise will help you choose the right size and model, after all getting the wrong bat could mean hating the game. When it comes to junior bats GM are pretty special. They cater to all price points and really know how to make light cricket bats that youngsters enjoy playing with. Its great to see our 8 year olds that come in for a size 3 and then as they go up a size, they seem to keep to the GM brand and just keep going up a size. The sections below give an insight into some of our favourites for the new season. We hope it helps you in that all so important decision. Gray Nicolls Classic Collection Cricket Bats are designed for the cricketer who like to bat at the crease or on the nets with a clean, retro style bat with a somewhat ”more serious” look. The stylish classic collection of cricket bats from Gray Nicolls include models that are suitable for all standards and type of player. The newly introduced Gray Nicolls Performance cricket bat model has been designed with a slightly shorter blade, which then allows for super thick edges and an imposing profile that offers serious power. Bat weights tend to start from around the 2.10 mark and really do offer the batsmen something new. Of these, Ultimate is the new budget model the Ultimate which comes as standard with a clear anti scuff sheet and fibreglass tapes edges for added protection. Lets talk a bit about each of these models. 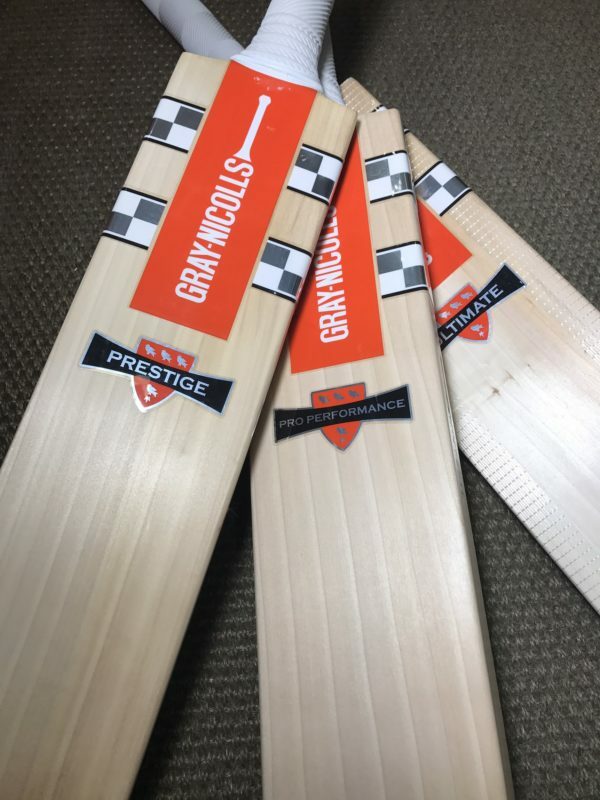 Now which of these cricket bat models you decide to choose from, the Gray Nicolls brand ensures a great looking bat with clean lines and great value for money. The Gray Nicolls Kaboom cricket bats have been endorsed by Australia’s explosive batsmen David Warner for many years now. David Warner’s batting style has graced many a cricket field and tormented numerous bowlers around the world. The loud graphics can be seen from the boundary and it’s this same powerful style of branding that passes through to the batsmen. The Kaboom cricket bats are light, pick up beautifully and offer great value to the all round player. 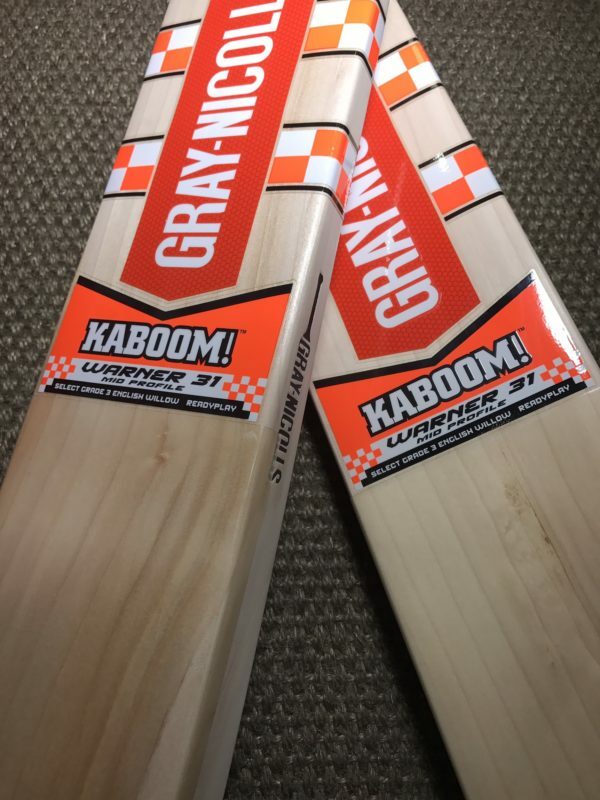 The Kaboom cricket bats are made from good quality English willow that has been carefully grown, kiln dried, cut and then made by Gray Nicolls skilled craftsmen. The history and heritage of the Gray Nicolls brand although always known through its traditional heritage, still reflects itself beautifully through this modern day cricket bat. You can order your Kaboom today and trust our in-store experts to pick out a great bat for you. Feel free to contact us for further information or why not visit our cricket equipment store in London and pick one out for yourself. The Gray Nicolls Predator was an iconic cricket bat and the choice of many batsmen. 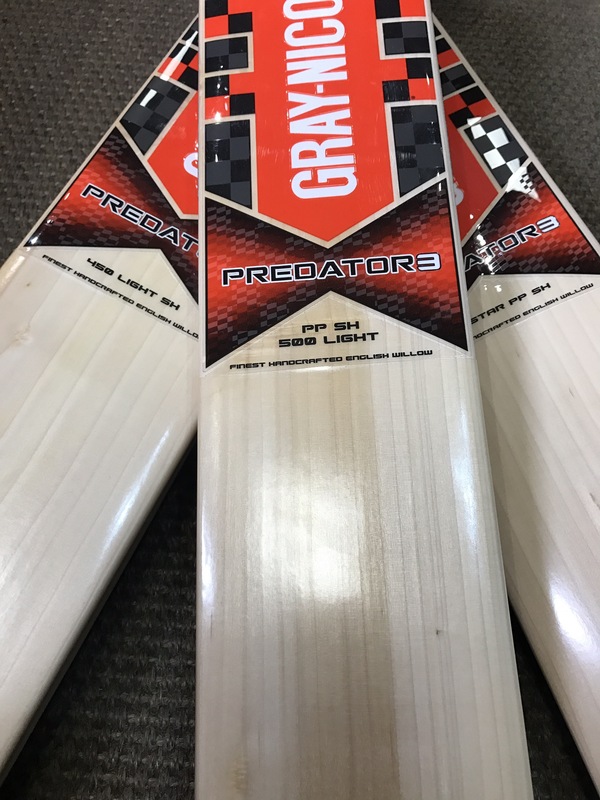 For 2017 the Gray Nicolls icon from yesteryear makes a return as the Gray Nicolls Predator 3. The Gray Nicolls Predator 3 has been designed with a fuller shaped profile and very steep spine so as to give the bat a very light feel. The mid swell sweet spot is ideally suited to both front and back foot players and along with the semi oval handle this model give the batsmen complete control at the crease. The Predator 3 is available in a variety of models for both junior and senior players. For those looking for a heavyweight and powerful cricket bat, the Halestorm Predator 3 provides some awesome power, albeit in a rather heavy weight design. The Predator models can be bought online by visiting our store in London, where you will find a multitude of weights available through the whole Predator 3 range. If you’re not able to visit us feel free to drop us a line or call us and we will be glad to pick out a bat for you. The Gray Nicolls Velocity cricket bat range provides power in abundance. This well crafted cricket bat is balanced and provides the batsmen with the perfect balance and pick up. The steep spine adds to the batsman’s confidence when at the crease. The striking design scheme is visually intimidating and adds to the batsmen’s confidence. The mid blade strike zone area and the sculpted profile gives this bat a great feel. The stylish graphics can be seen from all corners of the ground. The Kookaburra Kahuna cricket bat range has been at the forefront of the cricketing world for over a decade. The powerful profile, the thick edges and the infamous styling have made this cricket bat the perfect weapon of the strokemaker who likes to dominate the bowler and lead from the front. We have a variety of models within the Kookaburra Kahuna cricket bat range, at the helm of which is the Kahuna Pro model which is made from the top quality players specially selected grade 1 English Willow. This bat is supplied with a free of charge padded bat cover. The Kookaburra Kahuna 2000 is made from premium grade 1 Willow that will have well defined grains along with superb ping and performance. The Kookaburra Kahuna bats have a mid range sweetspot, the square edge profile along with the flat power plus face. For those looking for maximum willow behind the middle of the bat you can expect to see super spine height and a slight bow to help with the balance and pick up. Other bats are also available in the range including the heavyweight Obscene and Extreme models as well as the Lite. The round handle and grip make this a great choice for all types of batsmen and with models from the Kahuna Pro all the way down to the Kahuna 500 there is something to suit everybody. 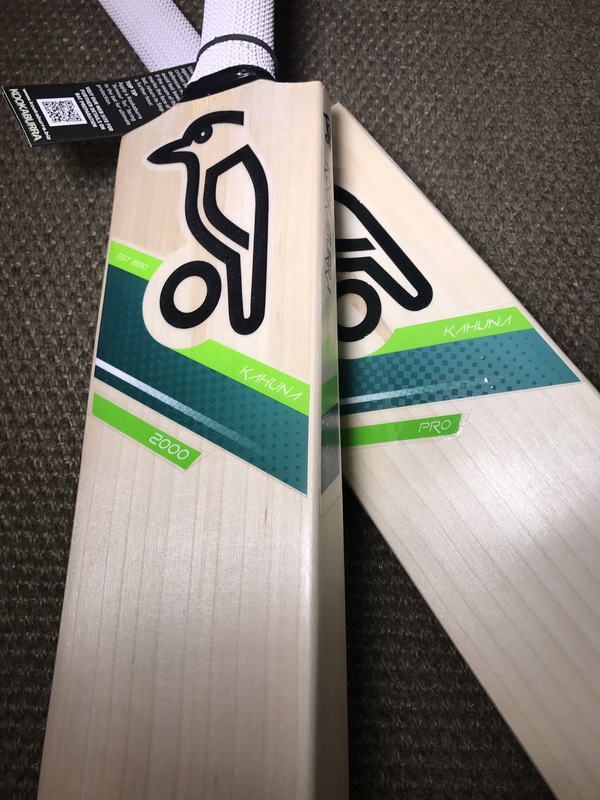 The Kookaburra Ghost cricket bat range simply comprised of a single model last year, but such was the success of this model that we now have a Kookaburra Ghost to suit every price point and playing style. 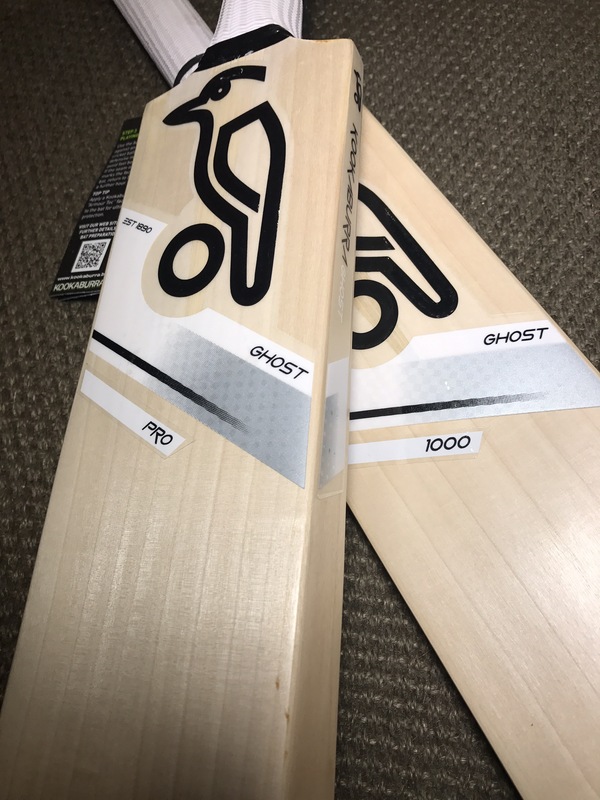 For the 2017 season the Kookaburra Ghost has been completely redesigned and with its genuine monster of a profile you get a bat that looks huge and menacing but with exceptionally light pick up. A minimal amount of concaving really does give this bat an awesome and powerful look. 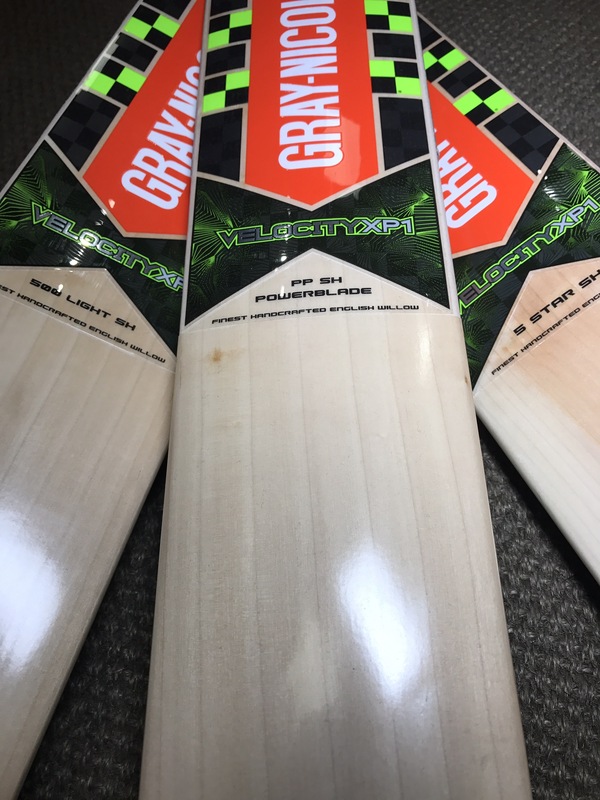 The Kookaburra Ghost cricket bat range is spearheaded by the top quality Pro model which has been handmade using players quality specially selected English willow and this model is also supplied with a free of charge bat cover. The Kookaburra Ghost bats have a mid range sweet spot, the big square edge profile along with the flat power plus face. The super spine height coupled with the minimal concave styling really make this a big bat and with the gently bowed blade and oval shaped handle the pick up on all the Kookaburra Ghost models is exceptional. 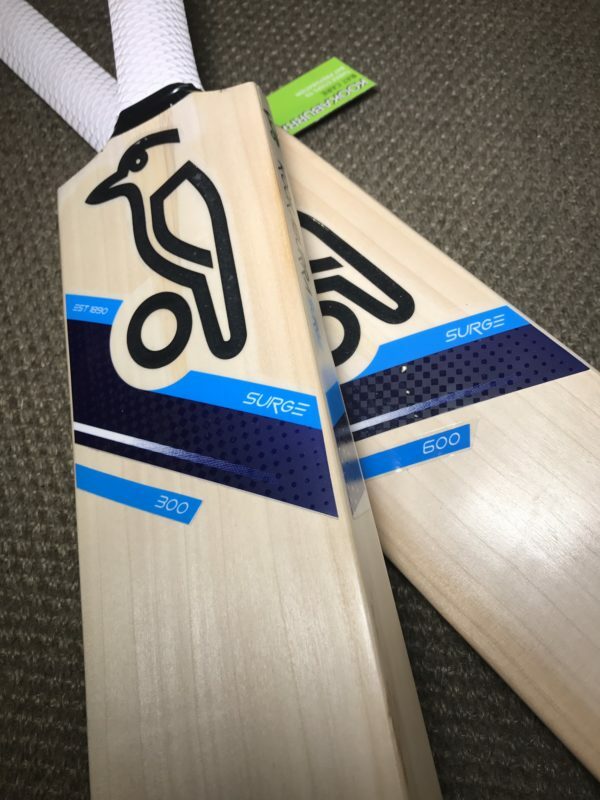 The new Kookaburra Surge cricket bats offered a fresh look for the 2017 season. An all new profile with a low middle along with distinctive shaping to the toe area of the bat offering enhanced pick up and balance. The stylish looks of the new Surge should make this bat a hit for the new season. So what can you expect from this new model? A low position sweet spot along with big square edges and a dynamic face profile with a slightly rounded face for all round control. The super spine height and minimal concave into the back along with a bowed blade and oval shaped handle make this a great cricket bat for the all-round player. The Kookaburra Surge is available at price points suited for all types of player. We have a good selection of bats in stock available for next day delivery. 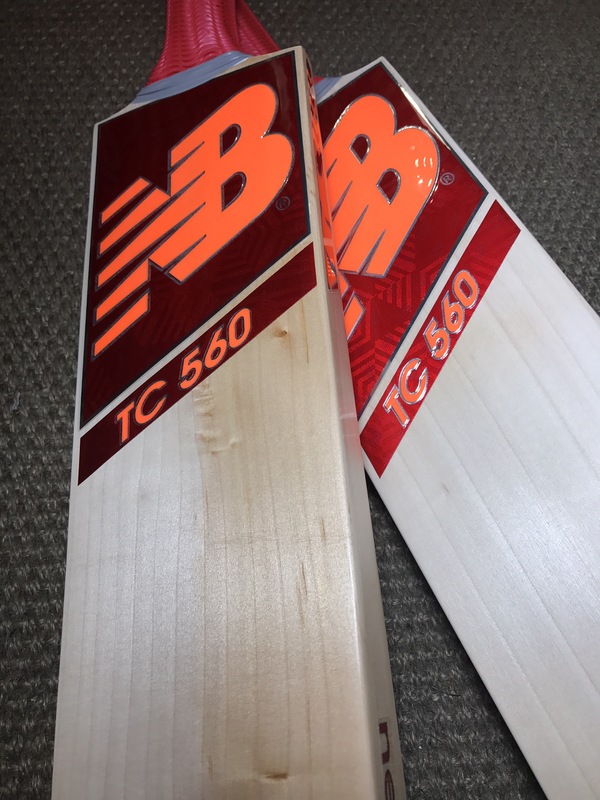 As used by England’s test batsmen Joe Root, the New Balance TC cricket bat has seen some serious coverage on the TV recently thanks to his many long and glorious innings since he started using the New Balance range. The striking red and yellow colour scheme along with the infamous NB branding has taken the cricketing world by storm and in turn New Balance into one of the hottest cricket equipment brands around. New Balance has a well balanced and light cricket bat range with a mid sweet spot position. These bats suit the all round player and that can be clearly seen from the all round play from Joe Root. Whether it’s his patient test innings or his explosive play during the one dayers, the New Balance bat ​has catered to Joe Root’s every cricketing need. The range is available for both junior and senior players with prices starting from £40 for juniors. For the senior players prices range from around £100 and go up to over £400 for the top of the range models. 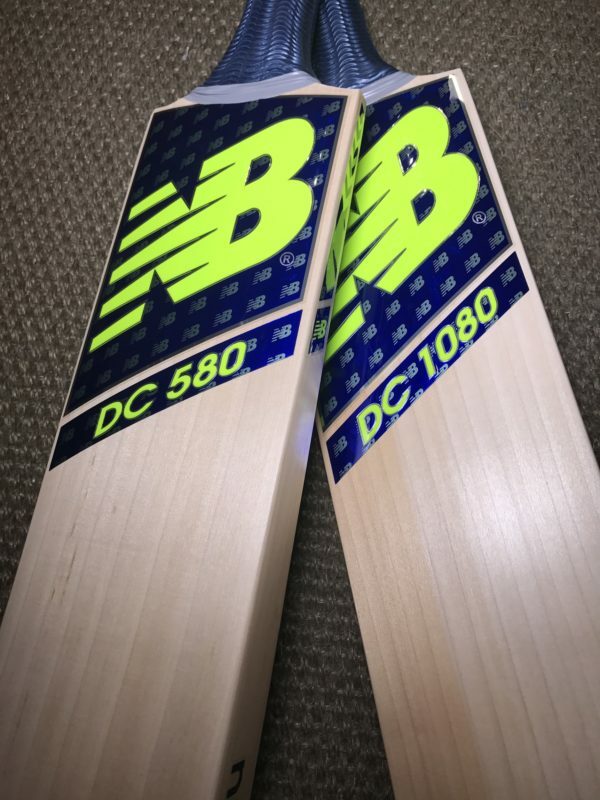 The New Balance DC range stands for Dynamic Cricket. Many of the world’s leading batsmen of the last few years have endorsed New Balance range including Australian opener Steve Smith and England’s Ben Stokes. DC bats are designed with a low swell hitting area along with thick edges and a powerful profile. The excellent quality willow used throughout the range gives these bats a large sweet spot hitting area, a fuller profile and steep spine. The eye-catching blue background to the logo stands out from the boundary and exudes class. The DC is certainly a dynamic cricket bat suitable for the all-round power player with its thick edges and powerful profile. Gunn and Moore have always made top quality cricket bats. The state of the art factory in Nottingham is renowned for its manufacturing processes and for the 2017 season the GM Chrome DXM cricket bat range will see GM produce yet another winner. The GM Chrome cricket bat range offers batsmen a low to mid swell area with a traditional length blade. The GM Chrome is made using the latest manufacturing processes thanks to the DXM machinery at the GM factory. The Chrome cricket bats are fitted with top quality treble spring handles that give outstanding feel with flex and control to the batsmen. 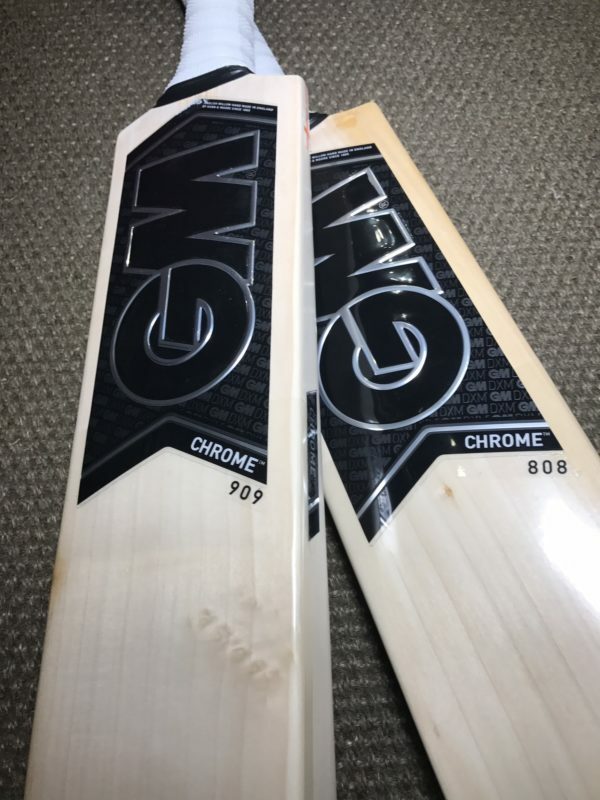 The huge edges and contours of the GM Chrome give this bat great power for all types of batsmen. The Chrome range is available in a variety of models from the 606 all the way up to the Original Limited Edition which is made from the finest premium grade 1 English Willow. The GM Chrome is available in a variety of weights and balances. 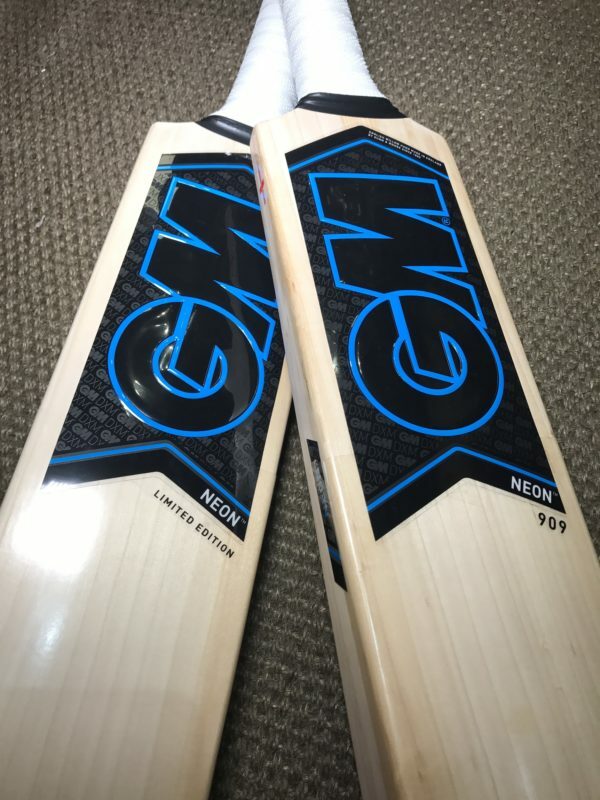 The GM Neon cricket bat range offers the batsmen a mid to high swell position with the shorter length blade. The Neon model is manufactured in Gunn and Moore’s state-of-the-art factory in Nottingham. 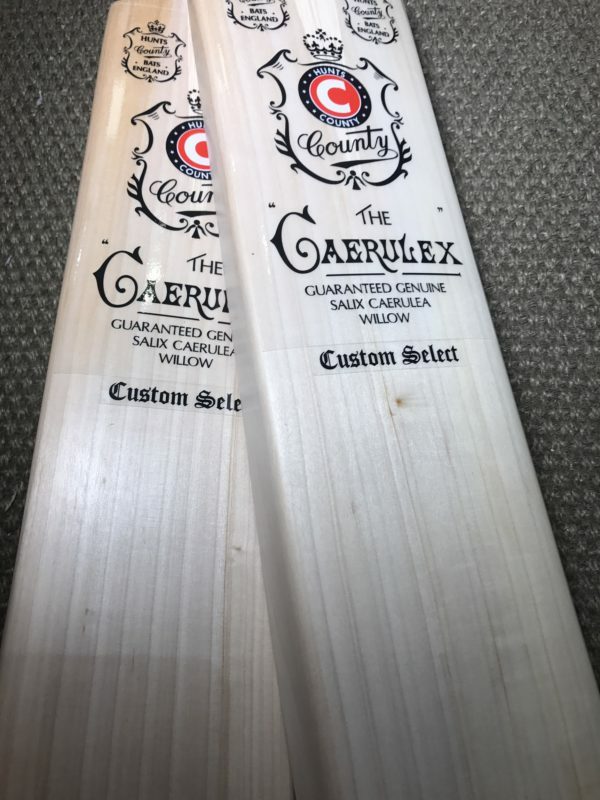 This bat has been designed and built with a shorter 540mm blade coupled with a 310mm handle so as to give the same overall length as a standard cricket bat. The advantage of doing that is by having a slightly shorter blade, more weight can be distributed to the hitting area, thus giving the batsmen a huge profile with power that is suited for all-round play. Gunn and Moore Kaha cricket bats are made at the GM factory in Nottingham using some of the most technologically advanced techniques in the world. GM make cricket bats like nobody else and they are proud of it. A family owned company, GM always invested great amounts of time and money into research and new ideas, hence the GM Kaha was born. The GM Kaha is designed with a shorter than normal blade. This means more wood in the shorter length blade can then be left in the sweetspot area of the bat, to give the batsmen even more power and leave the bowler at a serious disadvantage. The overall length of the bat remains the same though as the handle, length is extenuated. GM Kaha cricket bats offer great value for money to the power player, looking for something different. 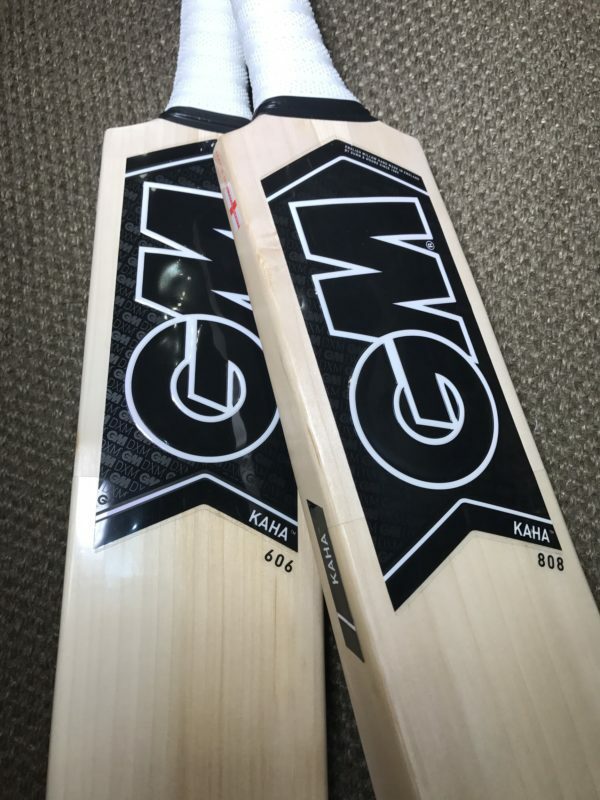 Manufactured in England using good quality English willow, GM Kaha bats offer the batsmen a real advantage on the field. Why not order yours today. 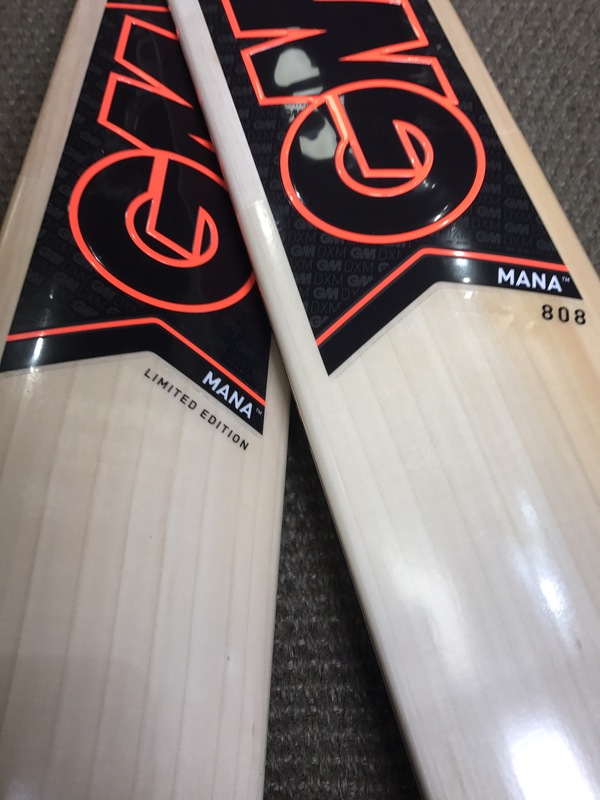 The GM Mana cricket bat range was one of our best selling bats in the first season it was introduced, so when we first heard of GM restyling revamping it we thought why? Then came the annual new product presentation held at the GM headquarters in September. That’s when we saw how something so good can be made even better. The new styling is understated yet striking. An imposing bat profile that suits all styles of play. The shorter length blade has been a huge success and makes the bat feel so much lighter, with great power distribution. The overall length if the blade is made up thanks to the longer handle. Hunts County are of one of the most understated English cricket bat brands around. They have produced some of the best and most innovative cricket bat designs over the last few decades such as the Insignia and Reflex models. We at VKS have always had a close friendship with the owner at Hunts County and when we recently approached him about a custom-made profile for us, he immediately agreed. So we have taken the very good looking Hunts County Caerelux model with its old style retro look, but then have given it a seriously modern twist with its thick edges, fuller profile and duck bill toe. We’ve ended up with is a seriously good looking cricket bat at a great price that performs to perfection. We’ve made the bat an affordable one that’s accessible to all with two great price points, coupled with the quality and bat making expertise that one expect from a true British bat maker like Hunts County. I hope you enjoyed my post on the top cricket bats for 2017, and I’m positive this will help you to decide which bat to opt for this cricketing season! Its always a good idea to walk into our cricket equipment shop in London to get a physical feel of things and pick out your new bat! Nothing beats a good Gray nicholls classic! Simple and elegant. Some brilliant looking bats here definitely, do find these days that now many brands are made in India a lot have handles have gone to being round rather than oval though. Nothing beats a good gray nicolls clasic, absolutely lovely bats!! Great bats, great reviews. You’ve got to love the sport that has such wonderful tools. MRF Genius Limited Edition bat is really good. My friend has the MRF Genius Limited Edition bat and I also tried it. It has good quality and it is very light weighted. Would love to see some SGs as well! Heard that they make bats for Kookaburra now. Great content guys… Really appreciate your work!